I stamped each image onto the white side of That's Crafty! #8 tags with Onyx Black Versafine ink, heat setting them with WOW! Clear Gloss embossing powder. 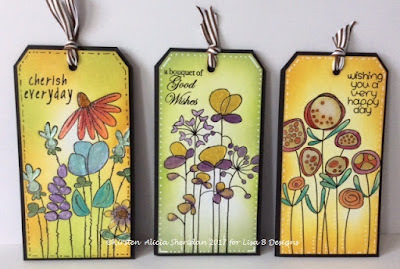 Once the masking fluid was dry I began applying Distress inks to the tags. I applied quite a lot of ink, building up colour & the masking fluid didn't move. 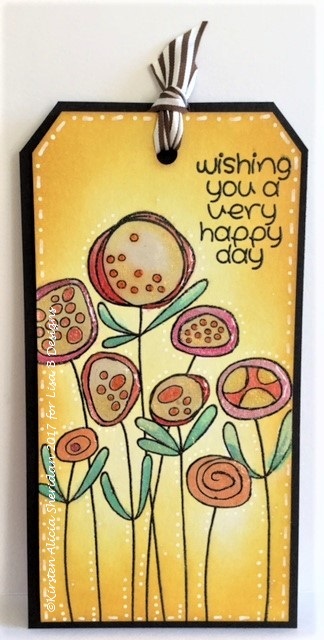 Lisa is on Hochanda today for Imagination Crafts. 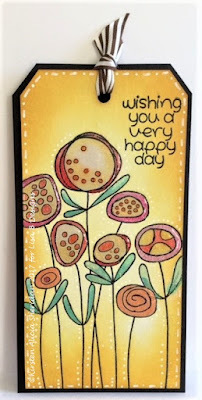 Programme times are 8am, 2pm & 6pm GMT & they're all about mixed media, art journalling & card making. 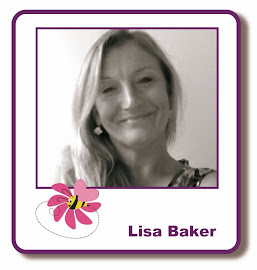 Thanks for visiting the Lisa B Designs blog today, I hope you enjoy the rest of the weekend. I'll be back on Monday with another of my April projects. Love these, they are all so 'happy'! love masking fluid, but always used my finger to remove it and got the image dirty when doing it! I didn't think of an eraser...doh!